The hookah coals were directly on top of the shisha! WTHookah! How could this be? When shisha begins to burn, the bowl gets harsh and loses all the good flavor. What kind of black magic voodoo was I now involved in? Once I got over the initial Shell Shock, I took a second glance, asked some questions, and began to enjoy smoking shisha the same way. You might be doubting every word on this page, but I ask you to try it before you make any judgements. Give it a chance. Come on, we used to know that the world was flat! Is it so hard to believe that smoking without foils is delicious and smooth? Here is how to do it properly. Follow these instructions closely or you might choose poorly. Step 1: Load your bowl with extra shisha. You need to build up a mound of shish in the middle that comes out of the bowl at least a half of an inch. This works best with a traditional Egyptian hookah bowl and wet shisha like Romman or Al Fakher. Step 2: Place a large coal, directly on the mound of shisha tobacco. You will hear some sizzling and may see a little smoke coming up off the bowl. Keep calm and prepare to smoke hookah. Step 3: If you skip any of these steps, do not take a shortcut here or you might look like this guy after your first puff. WAIT 10 TO15 MINUTES before you take your first puff of the hookah. Why wait? 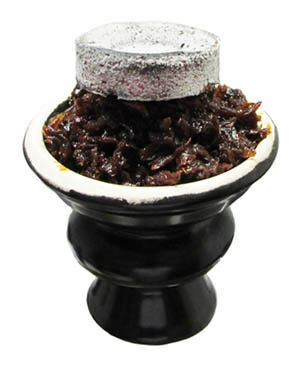 This time allows the hookah charcoal to cook through that extra mound of shisha on the bowl. After 10 minutes or so, an organic screen of charred shisha forms over your bowl. Step 4: Now that you have waited the required 10-15 minutes, take your first pull. It's OK to try a few smaller puffs at first to test the smoke, but you should be ready to enjoy a hearty bowl of shisha like an old school pro.... You know how much hookah foils used to cost back in the day? Neither do I, we never used them! Now...Are you up to the challenge? Do you have the bowls to give it a try or are you going to run for the safety of Boringtown, USA? We want to hear your stories about how this worked out for you, so leave us a comment about your experience and whether or not you would ever recommend this to a friend. Sounds like a colossal waste of perfectly good shisha. You'd probably go through shisha twice as fast at least using this method. I'll stick with using foil, thank you. Shisha is expensive enough without deliberately burning an extra half inch that you don't even get to smoke every time. Sounds like a method dreamed up by the shisha manufacturers to sell more shisha.